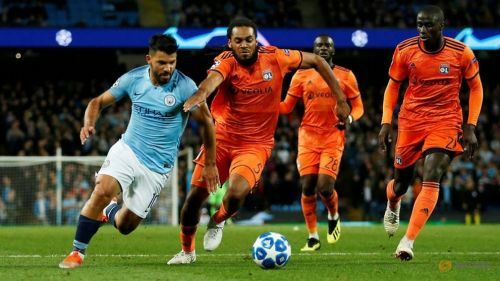 English champions, Manchester City, will travel to France to take on Olympique Lyonnais on Matchday 5 of the Champions League 2018-19 group stage. Manchester City only need a point to go through to the next round, whereas for Lyon, a loss will mean failing to qualify for the knockout stages. When Lyon visited the Etihad Stadium, they took away 3 vital points, and shocked everyone as they beat Manchester City 1-2. An impressive display put on by Lyon saw Maxwell Cornet and Nabil Fekir grabbing 2 first half goals, whereas Manchester City midfielder Bernardo Silva grabbed a consolation goal. Lyon do have players that can hurt Manchester City, and that was shown when the two sides met weeks ago. Nabil Fekir will be Lyon's main man to pull the strings, while in form Dutch striker, Memphis Depay, will look to grab another goal against the English champions. The surprising fact is that Lyon have not lost a game in the Champions League yet, but Manchester City who are favourites to win the group have. City have been blowing teams away in the Premier League, and are expected to win in tomorrow's match, and comfortably go through to the knockout stages. However, that isn't the case in the Champions League. David Silva grabbed a late winner in Germany against Hoffenheim, which seems to have been the turning point. Their Premier League ruthlessness was also shown in the Champions as they thrashed FC Shakhtar Donetsk 6-0 and 0-3. A comfortable 3-0 win against West Ham in the league will allow City go into this game with full confidence. Guardiola's men have shown they mean business, but haven't been able to replicate that in the Champions League. This year they will be looking to progress to the final after losing to Premier League opponents Liverpool in the quarter-finals last time out.